-The first musical comedy to come from Warner Brothers in four years, according to a January 1941 column by Louella Parsons. -Eddie Albert was orignally slated for the film, according to the January 1941 Parsons article. Martha Raye and Ann Sheridan at the beginning of “Navy Blues.” Unfortunately, neither has enough screen time for my liking. The New York Times review, published on Sept. 21, 1941, hit the nail on the head in their review saying, “Oakie and Haley working harder for laughs than a bum vaudeville team in Omaha” and that the script is full of corn. 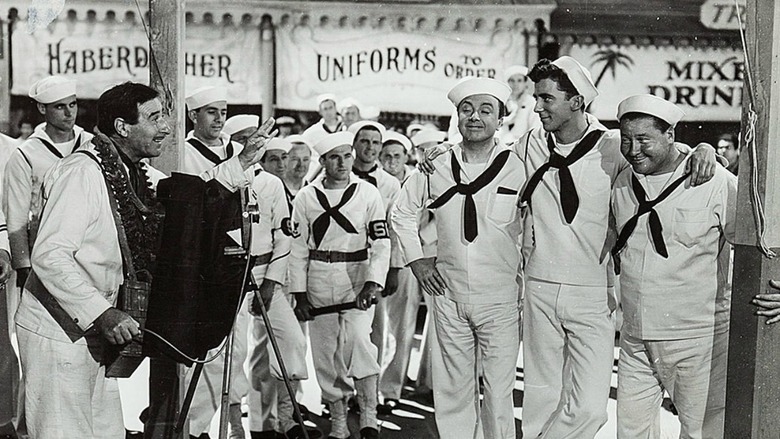 The film opens with Sheridan singing “Navy Blues,” looking beautiful in an adorable sailor style costume…but the film goes downhill from there. The film is centered around the crazy, frantic antics of Jack Haley and Jack Oakie as they do con their friends and will do anything to earn a buck. Our leading ladies Ann Sheridan and Martha Raye have very little screen time in this hour and 48 minute movie. The antics revolve around getting Herb Anderson’s character to stay in the Navy. One of the biggest highlights of this film for me was seeing Anderson (or Dennis the Menace’s dad, as my family frequently calls him) in a larger role. Before his TV dad fame, Anderson was a film character actor. His character actor roles were usually smaller than other character actors such as James Gleason or William Frawley. We even have the opportunity to hear Anderson sing. He’s just always someone I enjoy seeing on screen. His demeanor and turtle-like look makes me smile. 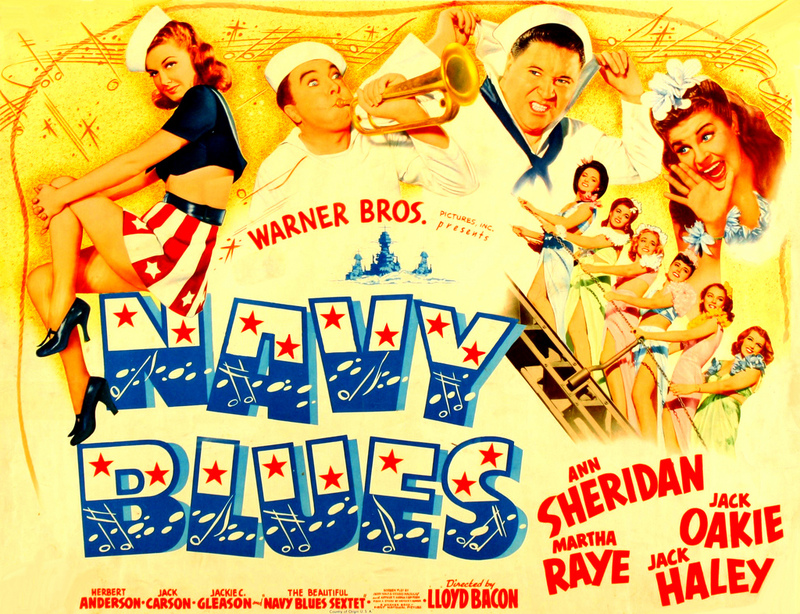 It was also a great surprise to see lovely Georgia Carroll appear in this film, singing as one of the Navy Blues Sextette Members. Carroll was the singer for band leader Kay Kyser’s band and the two later married. I believe I even shouted “That’s Georgia Carroll!” when she appeared on screen. 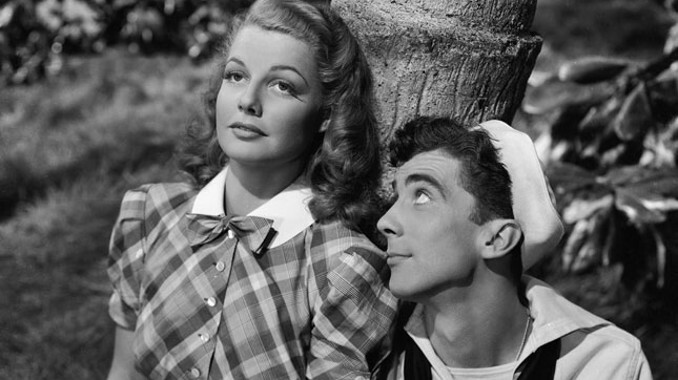 “Navy Blues” isn’t the worst musical I have ever seen, it’s simply that Oakie and Haley’s corn got tiresome when all I wanted was to see more Ann Sheridan. This entry was posted in Musical Monday and tagged Ann Sheridan, Georgia Carroll, Jack Haley, Jack Oakie, Martha Raye, Musical Monday, musicals, Navy musicals by Jnpickens. Bookmark the permalink. Your review pretty much hits the nail on the head. I would have preferred a story focusing on Ann Sheridan and Martha Raye, with the two Jacks in supporting roles. Just another example of Warner Bros. not knowing what to do with Ann Sheridan.